Mix refined flour, carom seeds, salt and pure ghee in a bowl. Add cold water as required to knead a stiff dough. Heat oil in a pan. Add asafoetida and cumin seeds. When the cumin seeds begin to change colour, add ginger, green chillies, green peas and salt. Mix and cook. Take off the heat and add garam masala powder. Mix and set aside to cool. Divide the dough into equal portions. Roll each portion and press to make round puris. Add scraped coconut and crushed peanuts to the green pea mixture and mix. Stuff each puri with the stuffing and further shape into a kachori. 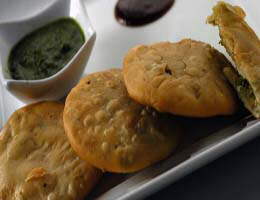 Heat sufficient oil in a kadai and deep fry the kachoris in medium hot oil till crisp and golden. Drain and place them on absorbent paper.